Marc Bembekoff is currently an independent curator. He studied film history and art history . After attending film programming at the national Museum of Modern Art – Centre Pompidou , he has been in charge of exhibitions at FRAC Champagne- Ardenne , and recently in charge of contemporary art programming Rodin Museum (” The body as sculpture “” Wim Delvoye “). Until July 2013, he was curator at the Palais de Tokyo where he performed among other personal exhibitions Damir Ocko , Maxime Rossi and Dewar & Gicquel , before coordinating the season “New Wave “. Meanwhile, he has a practice of independent curator . He and co- programmed ” Scratch Projection ” sessions experimental film and video artist , and curated several exhibitions including ” The eternal return : The Medusa ” ( The Bathroom , Lyon, 2008), ” beautiful images – First hypothesis ” with Céline Poulin ( the Box , Bourges, 2009) , ” From the closed world to the infinite universe “( Le Quartier , Quimper , 2012) ,” The Mystery Spot “( Fondation Ricard, Paris , 2012 ) . In 2004 , Marc co-founded Bembekoff Office / , a group of seven curators with whom he leads several projects in France and abroad . For Blouin ARTINFO , Marc Bembekoff his thoughts on his curatorial practice . 1 / Could you tell me about your curatorial through the season “New Wave ” of the Palais de Tokyo ? Under “New Wave ” , I put on two hats : the curator team part of the Palais de Tokyo are offering projects for which this institution was committed ( The Neuflize OBC Pavilion with “The Jacobson method “and SAM Art Projects with ” Henrique Oliveria – Baitogogo “) , and the general coordinator of the season by supporting various guest curators . I was able to have an early overview of what looked like “New Wave “. I was an actor ( as a participant ) and cinematographer ( as representative of the Palais de Tokyo). I tried, wherever possible, to put me down vis-à- vis other curators and artists . 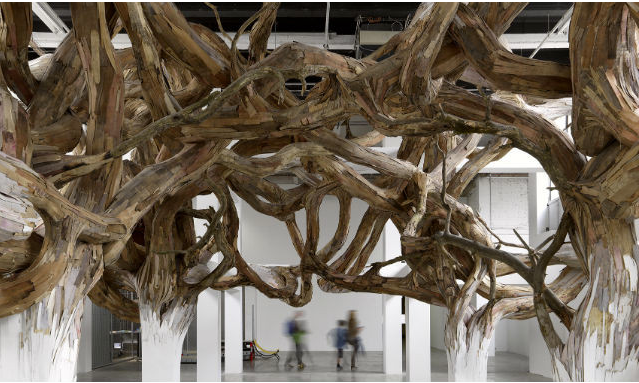 For example, Henrique Oliveira, I left relatively free – we very soon established a relationship of trust and exchange, making germinate As this sprawling installation and how it could play with the architecture of the building. Similarly, for the residents of Pavilion Neuflize OBC, I gave them clues , a starting point what this method Jacobson so they take ownership and shape each according to their sensibilities. 2 / How did you become a curator ? If you were to do another job , what would it be ? I fell in early curating , featuring objects in my room when I was a child … ! Having developed an interest in art as a teenager , my studies have led me naturally to the question of exposure. I first started to program experimental cinema at the Centre Pompidou then Scratch Projection . Yarn needle , I wanted out of this projection framework to invest physical space. I then directed my studies towards curatorial training (University Rennes 2 and University Paris X Nanterre) . 3 / ” Trustee ” or ” commissioner” ? Is that the terminology is important to you? For me , it is. I much prefer the idea of ​​” Trustee” which is a term whose etymology goes back to the Latin verb curare and ” take care of “. I quite like the idea of taking care of artists to accompany both a conceptual and practical point of view . 4 / curator is it an “author” ? There have been many debates on this qualification copyright , especially in France in the late 1990s with strong personalities such as Stephanie Moisdon- Trembley and Eric Troncy . For my part, without author , I think together fields of artistic action currents of thought . In my view, if the curator is the author , then it is necessarily an exquisite corpse , a writing several hands , the most critical are those of the artists. 5 / How the relationship that binds you to artists you define it? What makes you want to work with one of them in particular? I hope to establish a trading relationship with the artists. Attempt to support the long term – they bring me so much that I can bring their tracks . The artists who draw me involve a relationship of hand and mind . The idea – or concept – prevails over form. I love that artists lead me to other territories , challenge my assumptions. 6 / The curator should it be dedicated to successfully mount an exhibition? Could you work equally for all periods / areas / artists ? Some experience acquired over the years. We must keep it cool , while taking into consideration the technical data – I think in particular the standards of preventive conservation of ancient works . We must find the right balance : to have an accurate eye , a healthy relationship with the artists. The most important is to have a vision. 7 / What ethics do you defend ? That of the artist . 8 / A how public do you go ? To everyone, to the extent possible. I believe that contemporary art is an ideal vector for reframe our vision of the world, receive from another angle , that – poetic , political – artists . 9 / A curatorial can it still be ” subversive ” today? And how? I would like exhibitions today are a little more subversive (the ones I see in the first place! ) . This subversive must be in fields other than art, and even less in the history of exhibitions. 10 / We often talk about the book ” White Cube ” by Brian O ‘ Doherty as the reference for curators ? What is yours? It certainly would not be a book on curatorial issues. 11 / If you were to include an exhibition, a commission as an example, historical or current , which would you choose ? History : groves and paintings of Hubert Robert . Current ” Artempo . Where Time Becomes Art ” at the Palazzo Fortuny in 2007. 12 / We often speak of the economic difficulties of being a curator ? How do you experience these problems every day ? As an independent curator, these economic difficulties are indeed present , hence the need to find additional contract working for an institution. 13 / What future for curatorial practice ? A polymorphic future that reflect the multiple identities of curators from around the world . More pragmatically , official status and recognized by the French authorities , in this business that is still in its infancy. 14 / What are your plans ? The Biennale of Contemporary Art in Colmar, designed with Julien Fronsacq and entitled ” Sletto & Corso .” Opened with a parade of floral floats , this event will run from 21 September to 27 October 2013 . And exposure to the gallery Tiziana di Caro in Salerno , near Naples in the spring of 2014.